It has been a while since my last post but I am looking forward to Indian Wells which is just a couple of days away. The 2018 BNP Paribas Open main draw should be out late Monday (UK time) with main draw action set to start on Wednesday. I am planning to be more active on the blog so stay tuned. 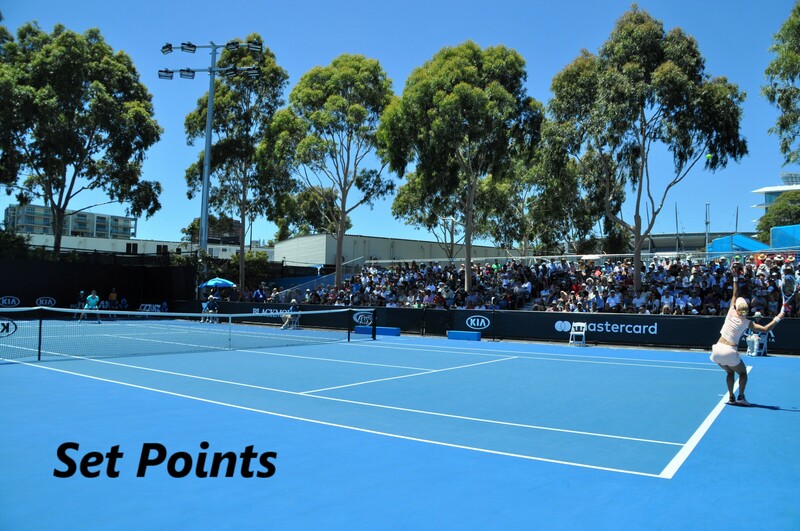 This Set Points is a catch-up on tennis news from the past week and a look ahead to the first Premier Mandatory of the year. Like London buses… last week Elina Svitolina defended her Dubai title and this week Lesia Tsurenko did the same in Acapulco. Tsurenko beat first time WTA finalist, Stefanie Voegele in Sunday’s showpiece, 5-7 7-6(2) 6-2. It was the first time that Tsurenko had been taken to three sets in Acapulco during her two triumphs. I watched a couple of matches but on the whole struggled to get excited about Acapulco. The time difference and late starting of matches made it difficult to watch anything live. I am so happy to see Victoria Azarenka practising at Indian Wells and set to play her first competitive match since Wimbledon. Azarenka has always been quite a divisive player with the fans. However, I think most people will be rooting for her after the last few months. Last year’s finalist, Svetlana Kuznetsova, will be back in action for the first time since having wrist injury. I loved the interview linked below by Reem Abulleil. The story about staying at Kim Clijsters’s house and the pigs was classic 😂. Azarenka joins Eugenie Bouchard, Caroline Dolehide, Claire Liu, Kayla Day, Danielle Collins, Amanda Anisimova and Sofya Zhuk on the list of wild cards into the main draw. Roberta Vinci and Sabine Lisicki both have wild cards into qualifying! #BNPPO18 wild cards a mix of familiar names, American youngsters: Azarenka, Bouchard, Escobedo, Opelka and more. Sadly Lucie Safarova has pulled out of Indian Wells which also means that the Team Bucie comeback will be delayed. It sounds like Lucie is still recovering from the virus that affected in Dubai. On a lighter note, I wrote a piece for Lucie’s official website about how I became a fan. I’ve really become fond of clay court tennis since going to Roland Garros and two of my favourite tournaments of the year are coming soon in Charleston and Stuttgart. While missing a top five player for now, Charleston’s line-up features most of my faves. As always, Stuttgart is knockout. I enjoyed a full-on baking weekend and i’m currently trying to improve at cakes. They have always been my nemesis. Today I made a pear upside down cake. I made a lot of mistakes but am content that it all came out of the tin in one piece! March 4, 2018 in Indian Wells, Set Points, WTA. Good win for Lesia, and well done to Stefanie Voegele for making her first WTA final. Just one more thing; Heather (Watson) won the doubles along with Tatjana Maria, well done to them. (Tatjana’s joined the club of tennis-playing mums now, and takes her daughter Charlotte wherever she goes to play). P.S. James you may not have thought you did a good job with that pear cake, but I’ll bet it tastes just fine! Ha thanks, Graham! Hope you are well. Errani wins Indian Well 125K. It’s possible that Errani’s the enforced 2 month ban helped her physically and mentally. Possibly the now 30y/o Errani should take 2 months off every year. The Moo no doubt liked Errani’s POWER UNDERHANDED serve on match point. The IW’s million dollar bonus to win both singles and dubs will be interesting. Just saw that! Reminded me of Bondarenko doing it herself at the US in that crazy match against Zheng Saisai. I can’t believe it’s not long till Indian Wells, again. Every year, often during a damp March in the UK, I watch it on TV, enviously. Everyone in t-shirts, drenched in sweat, palm trees against a perfect sky. One day I hope to go. Nice cake. I’d like to suggest – if you’ve never made one before – trying your hand at a tarte aux pommes. A well-made one is cake/tart heaven. Same, David. I’d love to go too one day. I’m so glad we are already into March as I hate winter! Thanks for the suggestion. I’ve never made one before so i’ll have to find a recipe! I quite fancy Caroline Garcia doing well over the flat season if she gets off to a good start at Charleston; Madrid in particular has seen some of her very best matches. Her game is just so perfect for clay when she utilises that kick serve and adds a bit of spin to her forehand. And she moves so well on it. Another 60k tourny next week in Shenzhen with the same cast of characters. Girls lunch, rice, tea and a fashion magazine. No matter how much Urszula studies fashion, she will never out do The Moo, as noted in his photo, standing in front of the Rod Laver Arena, dressed in sartorial splendor. Bondarenko, in the finals of the 125K IW yesterday, is defeated today in the first round of qualifying for the big IW by 19y/o Vera Lapko. IMO both finalist of the 125K should have been in the IW main draw. I didn’t know about this 60k tournament in Zhuhai. Decent line-up! Urszula Radwanska (ranked about #500) did qualify for the main draw in Zhuhai. Now she faces 15y/o Kostyuk in the first round. Sharapova vs Osaka—The match depends on Pova’s body and where Osaka’s mind is, edge to Osaka. Putintseva vs Van U—Poots is always entertaining, but Van U played very well in her Budapest win. Poots destroyed Van U in their two matches in ’13 and ’15. ‘Flipper’, edge to Van U.
Sharapova-Osaka the match of the round for me. Puig-Haddad Maia and Cornet-Zhuk were the other two matches that caught my eye.